On succeeding Gresley, Thompson started a process of standardisation. His first proposal concerned a mixed traffic Pacific. This was basically a mixed traffic non-streamlined A4 with Walschaerts valve gear on the centre cylinder. This design would replace the P1, P2, and V2 classes, along with some of the work being performed by the B7, B16, and K3 classes. Thompson started by rebuilding the P2s. These locomotives were built for the line between Edinburgh and Aberdeen, but the wheelbase was found to be too long for the continuous curves of this line. Also, the swing-link pony truck was causing damage by adding unnecessary stress to the frames. A similar pony truck arrangement on the V2s would eventually by fixed, but Thompson decided to approach the problem on the P2s with a complete rebuild. Existing parts would be used as much as possible, including the short outside connecting rods. This led to the outside cylinders being mounted relatively far back. The Gresley conjugated gear on the middle cylinder required a high level of maintenance, so Thompson replaced this with Walschaerts valve gear. For clearance, this meant the middle cylinder had to drive the leading driving axle. A Kylchap exhaust arrangement was fitted, as well as small wing-type smoke lifters. The first engine diagram appeared in August 1942 and rebuilding occurred between 1943 and 1944 at Doncaster. After rebuilding, the six A2/2 locomotives returned to Scotland to work the Edinburgh to Aberdeen line. At the end of 1949, they moved to England and were divided between the York and New England sheds. They kept their tablet exchange apparatus during the rebuilds, but this was removed after they were transferred to England. Under the 1943 renumbering scheme, they would have been numbered 990-5, but they did not receive their new numbers until after the 1946 renumbering scheme when they received the numbers 501-6. 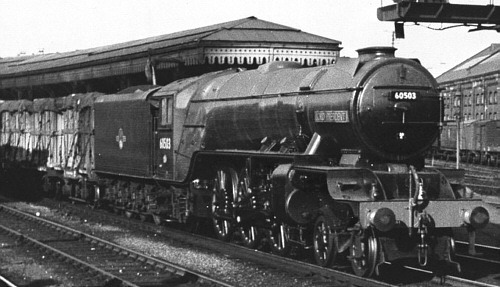 They then received the British Railways numbers 60501-6. Withdrawal occurred between 1959 and 1961. The A2/2s are often considered the least successful of Thompson's Pacific designs, but it has to be borne in mind that he was working with the flawed P2 design. The following details are for the class as a whole. Initially, No. 2002 carried the boiler with the long combustion chamber from P2 No. 2006. This had a firebox of 11ft 9in, with correspondingly shorter boiler tubes. This was scrapped after 18 months. Details relating to the tenders are for the standard 8-wheel tenders. The A2/2s were initially fitted with six wheel tenders. Heating Surface: Total: 3132.74 sq.ft. The last A2/2 was withdrawn in 1961, with none surviving into preservation. DJH also sell a kit of the A2/2 for O gauge (7mm scale). Thank you to the P.H. Groom collection for permission to use the above photograph of BR No. 60505 Thane of Fife. Thank you to Malcolm Peirson for the above picture of No. 60503 Lord President.